We know, shopping the JBF Presale is kind of like Christmas morning without the expense (or trash bags of wrapping paper). You are invited to be the savings hero of your family and shop the BIGGEST selection BEFORE we open to the public! If you are a JBF seller, you are so in. Plus, if you help at the sale, you get in even earlier. Not in one of those groups? No problem. Check out the Prime Time option below. The Norman presales are scheduled for Saturday, Feb. 9 between 9am-9pm. Consignor presale passes will be distributed at Drop Off. Volunteer names are placed on a special list. You will receive an arm band when you arrive to shop. Please bring your ID. Prime-time shopper requires a ticket from EventBrite which can be shown on your smartphone. PLEASE NOTE: Due to time and space constraints, we DO NOT allow children under the age of 16 to attend any presale times. The only exception is for nursing infants who can be carried "on" mom or dad. No strollers or car seat carriers, please. Remember the more shifts you select the earlier you shop! Check out our JBF FaceBook Page for the most UP TO DATE news about JBF! 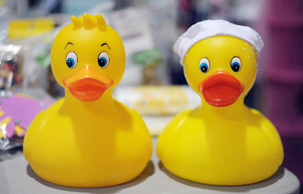 It's where we post current SALE pictures and FUN giveaways - who wants to win presale passes and JBF gift certificates?! UH-MAZING! Helpful Tip: Business pages are different than friend pages, you need to accept our notifications otherwise FB picks and chooses which posts you see. PHONE: click on the "Following" Icon and select the "See First" option - you are now in the JBF know. COMPUTER: look for the little thumbs up that says liked, hover over and change from default to "see first" in your news feed and under notifications select "all on" - you are now in the JBF know. IPAD OR KINDLE: next to the message icon you will see 3 little bubbles and the word "more" click or hover over "more", then select "notifications", then click "status updates" - you are now in the JBF know. Q. How often do you have Just Between Friends Sales? A. Twice a year. Typically during the spring season and the fall season. Q. Where is the Norman sale located? A. We are located at the Cleveland County Fairgrounds (615 E. Robinson, Norman, 73071. Q. Are children allowed on opening day? A. Yes, children are allowed at the sale on public days but not during Presales. Use good judgment when you bring them as the sale is usually very busy. Toys and other fun merchandise are available at the sale, but are not for use by little ones. A. There are no parking fees and admission is $2.00 on the first day only (consignors are not charged admission). All other days are free admission. Q. What should I bring when shopping at the sale? A. Bring a laundry basket or plastic container to put your items in while you shop! And a list of your child's measurements might be helpful, as well as a tape measure. A. Cash, Check, Mastercard, Visa and Discover. Q. What is a consignor? A. A consignor prepares and brings quality children's items to be sold. JBF will market, advertise, provide the building, and host the sale. We do all the paperwork and muscle work. A. 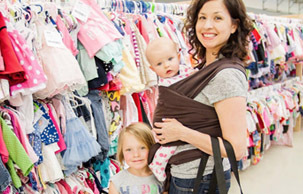 Anyone can consign their children's items with Just Between Friends. We request that you have a minimum of 20 items or $50 worth of items. Q. How do I sign up to become a consignor? A. Just click on our "Event Signup" page and fill out the form. You will recieve an email confirmation within moments. Registering is quick and easy! Q. Can I keep the same consignor number for all JBF sales? A. Yes! Once you register with JBF you will receive a Consignor Number which can be used for any sale you want to be a part of. Even if you move to another city you can participate with the same number. You will never have to re-tag items again! Q. Do consignors get to shop early? A. Yes! Consignors shop before the public. A. Consignors receive 60% of their sales less a $10 consignor fee (deducted from your check). If you volunteer or barter you will make 70% on all of your sales. Q: Is there a limit on the amount of items? A: There is a limit of 300 items for the Norman event - remember to only consign your best! A. You set your own price and you get to decide if it is discounted on our discount day. Q. What kind of tags do I use to price my items? Q. Should I let my items be discounted? A. We suggest that you let your items sell in the percent off sales. Mark the starting price up if it is something you are sentimental about, but of course it is your decision. Remember, starred items WILL remain Full Price and customers are looking for discounted items on the last day. A. Most consignors sell approximately 80% of their items in sizes 2-8. For sizes under 24 months the percentage drops due to the sheer volume of merchandise received. People receive infant clothing as gifts, hand me downs etc. The older sizes (10-16) tend to sell at a lower percentage as children become pickier when they near the teen and pre-teen years. A. Please allow approximately one hour for drop off (dependent upon the amount of items you bring). A. When you arrive your items will already be sorted by Consignor# for easy pickup. Stained and defective items will not be sorted, but consignors may claim those items in a separate area. Q. Can I have a friend drop off and/or pick up my items? A. Yes, send them an email or text with permission and your consignor number, which can be shown if needed, when they arrive. A. Your consignor check will be mailed fourteen days after the sale completion. A. Yes, with our barcoding system you will be able to keep a record of all the items you sell. Also, if you donate items at the end of the sale you will be able to print off an inventory list for your taxes and we will send you a donation slip with your check. Q. Where do I find hangers? A. We require plastic tube hangers which can be found at most discount stores. Several department stores, will give you leftover hangers at the end of the day, if you need a lot, ask if you can buy them. The other place to try is your local dollar store. Q. Do I get my hangers back? A. All JBF clothing items are sold with hangers so we are unable to return consignor hangers. Your unsold clothing will be returned on hangers. A. No. Consignors drop off their items and put them out on the selling floor during the designated drop-off times and come back during the designated times to pick up their unsold items. We do the rest! Q. Do you accept lightweight pants or long sleeve shirts for the spring sale? A. Jeans, lightweight khakis, and capris are fine. All other pants should be saved for the fall sale. We accept the Gymboree-type transitional spring clothing lines, which occassionally include light weight long sleeve shirts. If rack space becomes limited we may not accept borderline items until the fall. Q. Do you accept short sleeve shirts for the fall sale? A. We accept boy short sleeve dress shirts if they are fall colors and style. All other short sleeve shirts should be saved for the spring. If rack space becomes limited we may not accept borderline items until the spring. Q. Do you accept junior clothing? A. No, We are unable to accept junior clothing. Q. Do you accept maternity wear? A. Yes, we do accept maternity clothing. Due to limited rack space we can only accept the following maternity brands: Old Navy, Gap, Mimi and Pea in the Pod and boutique. All seasons of maternity items are accepted. Q. Do you accept videos or stuffed animals? A. No. VHS and stuffed animals take up a large amount of space and do not sell very well. You may bring unscratched DVDs and battery operated stuffed toys. Q. I am selling a crib, does it need to be assembled? A. Yes. Cribs sell better when the customer can see what it actually looks like and it helps to ensure that all pieces are present. Due to recalls and updates in industry standards, consignors must complete a crib waiver. Please review our Safety & Recall page for more information. Q. Can anyone sign up as a volunteer and attend the presales? A. Yes, anyone may sign up to volunteer on a first come/first serve basis. We welcome husbands and grandparents. Q. Can I bring a guest to the volunteer presale? A. Volunteers may not bring guests. Each pre-sale pass is good for one person to enter the presale. No children at the presales. Q. 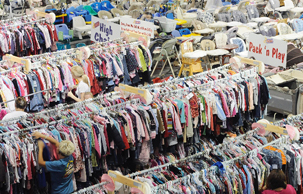 How can I make more money consigning at JBF? A. If you volunteer or barter you will earn an extra 10% on all the items you sell - that means you will make 70% instead of 60%. Q. Do you provide childcare for volunteers? A. If you are pregnant or have a medical condition, you will want to volunteer when the workload is less. We have several shifts available that can be done sitting down. Let us know when you arrive to help and we will accommodate your needs. Q. Can I bring a stroller or wagon to the presale? A. No. However we do have a limited number of X-large handled shopping bags for your convenience or you may bring a laundry basket to hold all of your bargains. We also have a hold area for your convenience.